Save Sefton Park Meadows is conducting a survey of ALL political and independent candidates for the local May 7th election to ask their views on the sale of Sefton Park Meadows AND other great Liverpool greenspaces for development . At Wed 22nd April, see first response received Candidates List (Interim). Liberal Democrats have sent an ‘all candidates response’ to say they are ALL opposing the sale of Sefton Park Meadows and other proposed greenspaces in Liverpool. FULL SURVEY responses and comments we receive will be published here and on our Facebook site from Wed 29th April 2015. 1. Do you agree Sefton Park Meadows should be sold for housing development? 2. Do you agree with the sale of other parks or greenspaces in Liverpool for development? You can find a list of all local candidates in your wards with their contact details here: Candidates-local-elections-all-wards. Sitting councillors can still be emailed at their council email address. See link here to find your current councillors. If supporters also want to contact candidates standing as local MPs and MEPs, you can also find their details here: MPs-nominated. Please write to or email them as soon as possible. We have 2 weeks to election day and find out their views on Liverpool’s threatened greenspaces! If candidates do not wish to respond – or we receive no response from individuals – we will also publicise this. PLEASE LET US KNOW THROUGH OUR FACEBOOK PAGE WHEN YOU HAVE HAD A RESPONSE or email pell.scholes@btinternet.com. From the beginning of our campaign, we said that the issue of Sefton Park Meadows – and now other greenspace loss – would become an important local election issue. The Green Party saw Cllr Lawrence Brown elected in Greenbank Ward over the Meadows last year. 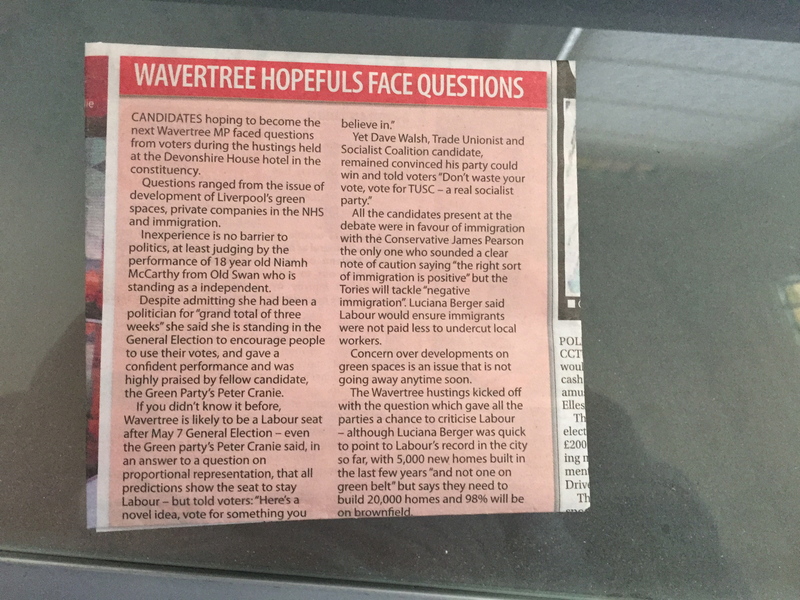 An article ( below) in the Liverpool Echo ( 17th April 15) about a candidates hustings in Wavertree supports this. We will also work hard to make the issue of the Meadows and other greenspaces sell off high on the agenda for candidates in the next Liverpool Mayor elections in 2016 with your support. Please come and join the Save Sefton Park Meadows Campaign and Liverpool green space groups demonstrating outside the Town Hall from 4 to 5pm on Wednesday 8 April 2015, ahead of the Council Meeting starting at 5pm. Liverpool Echo article here. This is the last full Council meeting until after the 7 May Local & General Elections and an opportunity to show the strength of feeling from all Save Our Green Spaces campaign groups to Council plans to sell off our precious green spaces.